I usually think of chocolates when I think of Laura Secord. However, the Laura Secord hike organized by the Niagara Club of the Bruce Trail takes us back into Canadian history. The British and the Americans were fighting in the War of 1812. 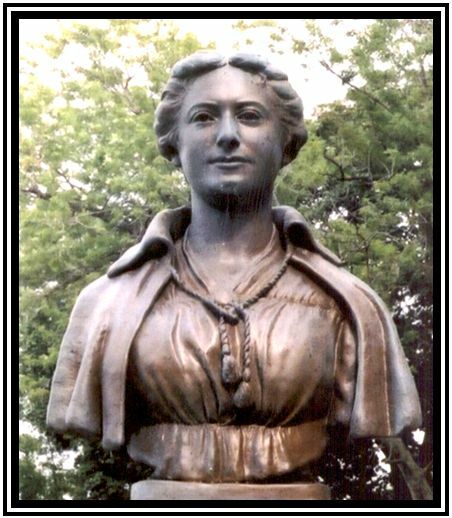 Laura Secord, neé Ingorsoll, was born in Massachusetts, U.S.A. She moved with her Loyalist family (Americans who supported the British during the American Revolutionary War) to Upper Canada (now Ontario). She married James Secord and lived in the small village of Queenston in the Niagara Region. One day in June 1913, Laura Secord overheard some American soldiers who came to her house talking about the plan of a surprise attack on the British soldiers in Beaver Dams. She set foot on a 32 Km (20 miles) journey, arriving at De Cew House on June 22, 1813 to warn Lieutenant Fitzgibbon about the American ploy. Two days later, the British defeated the American at the Battle of Beaver Dams. 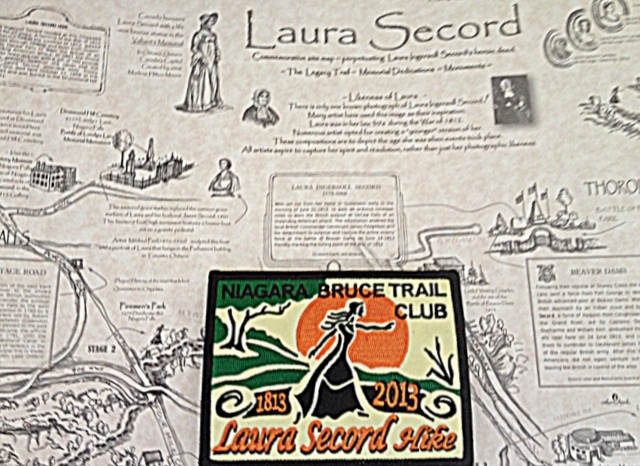 To commemorate Laura Secord’s walk, the Niagara Club of the Bruce Trail Conservancy organizes a Laura Secord hike every year. This year is the Bicentennial Hike. My husband and I arrived at the meeting place–car park of the Niagara Region office–at 5:45 a.m. to board a bus which took us to Laura Secord’s Homestead in Queenston to start the hike. The town was asleep, but the sun was up, and the town was adorned with flags to mark the bicentennial occasion. Around the corner of the Homestead, General Brock Column came into view. We began our climb up the stairs beside the printing museum. It was a couple of kilometres of hills to reach the Queenston Park, where there was also monument to remember Laura Secord. The Bruce Trail Main Trail began here. Our journey was to follow the white blazers of the Main Trail until we get to De Cew House in St. Catharines. There were so much to see on this hike. The terrains were variable, hence providing interesting challenges. The part I liked the least were the muddy downhills. Otherwise, I enjoyed the occasional leap over a water puddle or a stream, and an incline when my hiking stick became an asset. We came to a hill where everybody had to climb down carefully, due to the muddy slipperiness. It was a relief to overcome this steep slope! We continued by climbing over a stile to enter a private property, came out to walk on city roads, and walked over a bridge which crossed the highway. We hiked on narrow country paths, past a swamp, on the edge of people’s backyard and through the vineyards of Niagara. We looked out for historical features along our route. Besides Laura Secord’s homestead, General Brock Column and the Mackenzie Printery and Newspaper Museum in Queenston, we walked through the Screaming Tunnel, which according to legend, a young girl died here and if you strike a match inside the tunnel, you’ll hear her screaming. 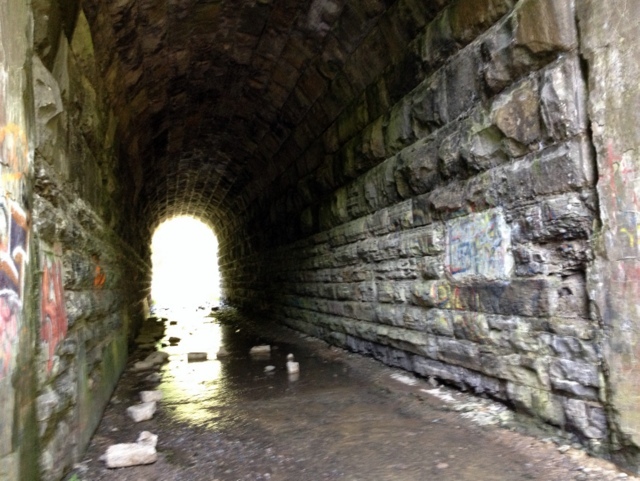 The tunnel was dark and wet. There was such a eerie feel to it that we just hurried on. For a few kilometres, we were walking along the banks of the Welland Canal. Only Canal #3 was in operation and to my delight, I came across a lift bridge, which had played a very important role in the industrial development of southern Ontario. Our last lag was to hike around the campus of Brock University. When finally we saw the grounds of De Cew House of which only the relics of the foundation remained, we picked up our pace to cross the river, and were received by Laura Secord and her friend. It was a long hike and it took us over six hours to complete the 32 Kilometres. The Niagara Bruce Trail Club provided the hikers with a wholesome lunch at De Cew House, and very hospitable reception on all the four check points. The greatest reward at the end of the day was the badge of the Laura Secord Bicentennial Hike to sew on my backpack. This entry was posted in Hiking, History, Nature, Trails, Walking and tagged Battle of 1812, Battle of Beaver Dams, Bruce Trail, Laura Secord, Laura Secord Bicentennial Hike, Niagara region, Queenston on June 27, 2013 by Opalla.